(June 2017) 50th Anniversary of METAL! Thursday afternoon 29 June 2017 METAL will celebrate her 50th anniversary. Friday 30 June 2017 METAL will be closed in connection with this occasion as an excursion with all employees will be made. 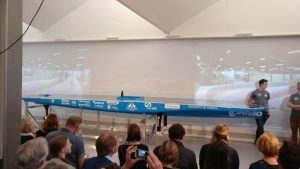 On Thursday, May 18th, the celebration of the Solar Boat Twente took place by the student team of the University of Twente. METAL is co-sponsor and wishes the team a lot of success at the NK for solar boats in Akkrum, the Netherlands, on 26 and 27 May next and at the Monaco Solar Electric Challenge on 13th to 15th of July next. (April 2017) Nice order from the University of Twente! 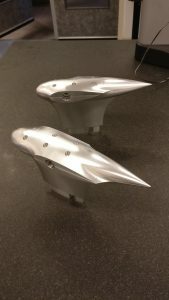 METAL received from the University of Twente a nice order for the delivery of rotor parts. (March 2017) Order Klopman, Italy. METAL received a nice order from the Italian company Klopman for the delivery of a special machine suitable for upgrading quality cloth. The unit will be delivered in September 2017. 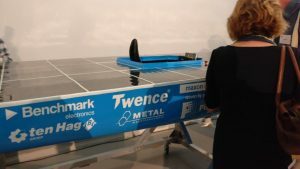 (March 2017) Sponsoring Solar Boat Team Twente. Because of our 50th anniversary coming summer METAL will sponsor the Solar Boat Team Twente. Click on the link and see this challenging project of our students from Twente. METAL received a great order from Huntsman Textile Effects (Germany) GmbH for the delivery of a washer / dryer machine for the laboratory. 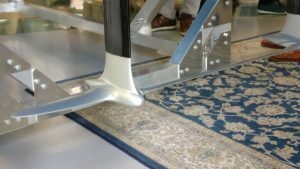 The machine is an important part in the certification of flame retardant textiles. The machine will be delivered in spring 2017. (November 2016) Purchase of a new machine! METAL has invested in a new Spinner machine which will replace the current DMU 50. The machine will be installed in week 3, 2017. (October 2016) Once again receipt of great order from EPDM Romania, Romania! We are delighted to inform you that METAL received once again a great order from EPDM Romania, Romania, for the construction of mobile welding machines for EPDM foil. EPDM foil is increasingly used as roofing and pond solutions. EPDM foil is prized for its durability and elastic properties. (July 2016) Extensive order from Senro B.V.! METAL received an extensive order from Senro B.V. for machining of rollers which will be used in recycling machines. The delivery time of this order will be end of October 2016. (July 2016) Fantastic order Flexirub, France! For the French firm Flexirub METAL will fabricate a EPDM welding system of 25 meter and three mobile welding systems. Of course METAL is very happy with this nice order.